There’s a couple of items that people have sent me recently that I’d like to get off my desk before getting into more Hodgson work. I appreciate all the feedback I get from everyone who reads this blog and I especially enjoy hearing about new and exciting Hodgsonian items! 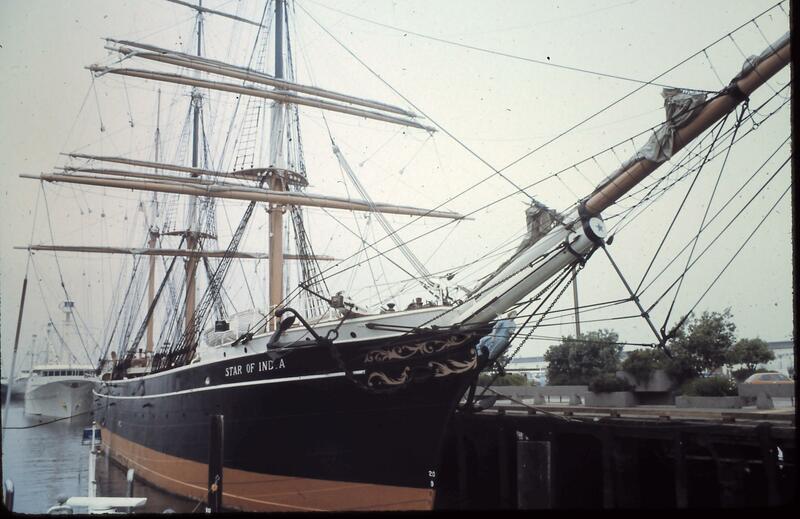 The ever helpful Gene Biancheri sends along this photo of the Star of India which, as longtime readers of this blog will remember was actually a ship that Hodgson had sailed on when it was named the Euterpe. This photo was taken in May of 1976 but the ship is still docked in San Francisco should anyone care to visit. If it were not on the opposite coast from me, I would probably try to live on it if I could! I am still amazed at the thought that it is possible to step aboard one of the actual ships that Hodgson served upon. You can read the original blog post about the Star of India here. Another item comes from noted Hodgson scholar, Jane Frank, who writes in to remind me that WHH did receive the Royal Humane Society medal in 1898. This is in reference to my earlier post regarding WHH’s posthumous medal which I wrote about in this blog post: “A Medal for Hodgson”. On the 28th March 1898, a man accidentally fell overboard from his ship in the harbour at Port Chalmers, New Zealand, the distance from shore 600 yards, and the water infested with sharks. Hodgson jumped after him, and kept him afloat for 25 minutes, when they were picked up by a boat half a mile from the ship. The Royal Humane Society Bronze Medal was introduced in 1837. It is awarded to people who have put their own lives at great risk to save or attempt to save someone else. It is accompanied by a Certificate signed by the Society’s President, HRH Princess Alexandra. Unfortunately, we have no idea where this medal might be today. It is certainly likely that WHH’s widow, Bessie, kept this along with the posthumous medal she received. However, she never remarried and had no children. Perhaps, upon Bessie’s death, these medals might have been bequeathed to WHH’s sister, Lizzie, but I do not know. Unless someone can provide a copy of Bessie’s (and/or Lizzie’s) will, this will remain an open question. Even then, the wills may not provide an answer. Hodgson collector par excellance, Dave Kurzman, provided the following photos of another unique volume. 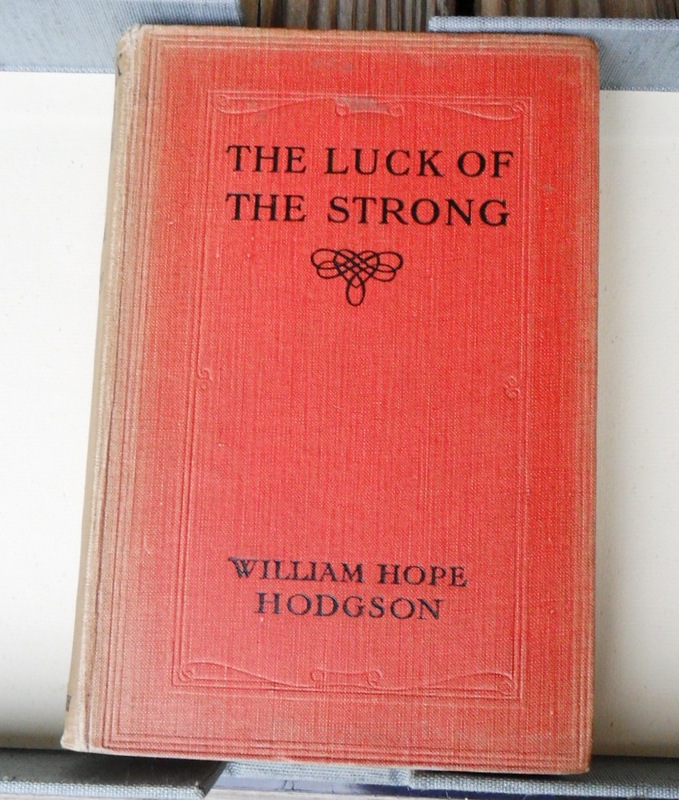 This time it is Bessie Hodgson’s personal copy of WHH’s collection, THE LUCK OF THE STRONG. Especially poignant is the death notice placed on the inside front cover. Mrs. Hodgson’s name and address are on the front page. Many thanks to Dave for sharing this very unique Hodgson item with us! Not as many people have voted in the poll as I would have liked. It is really a great help to me as it determines the type of material I post here on the blog. If you’d still like to vote, you can do so here. One of the interesting things about the votes so far is that the majority want to see more posts about Hodgson’s writing! While that is certainly heartening to me, it is also a little taunting as those are the types of posts that take the longest time to do. And, surprisingly enough, my days are not completely filled with Hodgson! Still, I will attempt to fulfill that demand as often as possible. One of the ways that I will be doing that is beginning a regular series focusing completely on the Carnacki stories. I will be starting that series next Monday, November 12th, and will be examining all of the stories in full with the final article focusing on “The Hog” in which I will address the curious publishing history of the tale and also the persistent rumors that WHH did not write the story. I hope you will all enjoy it. Several people have remarked to me that this blog is specifically responsible for renewing their interest in Hodgson. This makes me very happy as this is one of the biggest reasons I started this blog in the first place! The more people who talk about WHH, the more people who will want to read WHH! In some ways, it is like pushing a boulder up a hill. It’s an enormous effort at first but, once you reach that crest, it’s amazing how quickly it will speed up. Great material! That copy of LUCK OF THE STRONG is especially intriguing to see! I think that the photo of that is especially heartbreaking with the newsclipping of WHH’s death pasted on the inside front cover. We know so little about WHH’s personal relationships and next to nothing about his marriage. From outside appearances, they seemed to have been very happy. Certainly his widow never remarried and continued to champion WHH’s work until her own death.